College has been one of the greatest times in my life. As a senior at the University of North Dakota, I have seen my share of good and bad decisions. 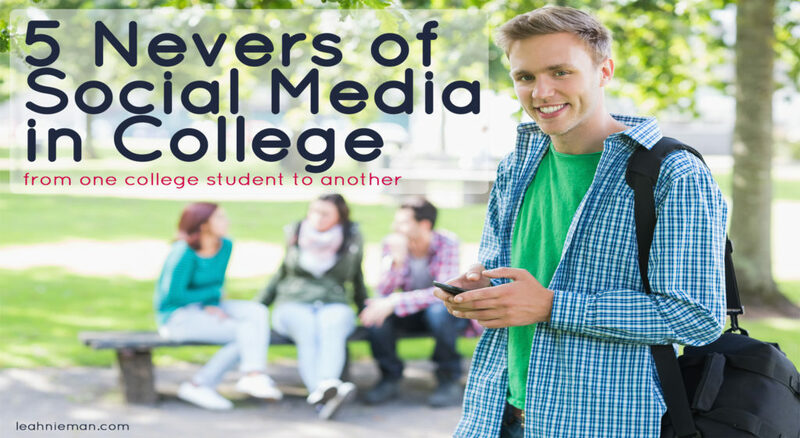 While many millennials, like myself, fully embrace the advantages of the modern world we live in, there are many precautions one should take when dealing with social media in college. Social media means we can instantly and easily share our college experiences with friends and family. Grandparents love seeing our pictures of campus as we walk to our first class of the year. Friends like our memes about eating pizza and sleeping on futons. And, parents love seeing that screenshot of our GPA at the end of our semester. But, social media is a powerful tool that must be used with care. The things we post could potentially affect our lives long-term. This fact became ever so clear to me after seeing kids on my campus make irresponsible decisions across multiple platforms this year. So, I thought some wisdom from a current college student could help all of us as we approach a new college year. Parties are part of what people call the “college experience.” I’ve had my fair share of parties in college, and I can tell you, nothing irks me more than seeing profile pictures of kids at the college frat houses pretending to chug a whole bottle of Svedka straight. Nothing projects “I’m young and stupid” quite like that, especially if you’re under 21. If you are 21, a picture of you at a bar holding a beer is acceptable. But, make sure that it is appropriate for the field you are entering. Taking 5 seconds before you post something on Instagram or Facebook is the difference between a good decision and a bad decision. Political mudslinging is another decision that may make you unmarketable in a professional atmosphere. Unfortunately, social media has allowed EVERYONE to project their voices into the lives of others. Even the village idiot can cram his love for Hillary Clinton, Bernie Sanders, Donald Trump, Ted Cruz, or whoever they choose, into everyone’s ear canal. Holding a political standing is not wrong. But the way we disagree with people says a lot about how we handle situations. This is especially true in college, where we have newfound political, social, and cultural ideologies. Being passionate and being militant is a very blurry line for students. Just know, if it tears someone down, it’s political mudslinging. If it builds someone up, it is probably okay to post. Do not post angry statuses about professors, friends, the school, etc. On the topic of militant vs. passionate, posting angry statuses is a huge “no no” while you’re in college. University is stressful, tiring, and hard. But the way we handle it says a lot to others about how we deal with these stressors. Life has its ups and downs. College is a great time to learn how to deal with deadlines and pressures. Posting how your professor knows nothing about late-Renaissance art is an unhealthy way of dealing with your borderline failing grade in that class. Instead, talk to a friend about it. If there’s anything I’ve learned about college, it’s that you always have a friend to talk to about issues. This next rule should come as an obvious tip, but amazingly, some people don’t realize that this isn’t the mid-1800s and post it anyway. Racial slurs and offensive language are NOT okay. When I was in the first semester of my junior year, three freshmen were considered for expulsion from my school for posting extremely racially offensive images and text on Snapchat. Stupidity exists in many forms. A fast track to expulsion is by posting things that could potentially be perceived as offensive to minority groups. Just don’t do it. Being kicked out of school is not worth the cheap laugh. Not to mention, offensive comments are likely to cost you potential jobs. On a lighter note, I will advise every college student to abandon Tinder. This is from someone who dated a Tinder match for 2 years. Tinder is great to meet people the easy way, but there is no easy way to network with people outside of college. Introductions are always the hardest part of meeting people. Intros can be awkward, but practice makes perfect! Get to know people through clubs and classes on campus, not through the Internet. Guys, if you want to ask out that pretty girl in class, go up and ask. Girls, do likewise. You will build better relationships by meeting people face-to-face. You might think these rules for social media in college aren’t needed. I mean, most of us have been using social media for a long time. We’re responsible. Or maybe these rules seem harsh at first glance. But, the reality is, your “friends” on Facebook are not the only ones who see your content. Many businesses check out your social media pages prior to hiring you. And chances are, that picture you shot gunning a beer at a college party isn’t going to help you land the teaching job you’ve been dreaming of. The rules of social media in college boil down to common sense. If you wouldn’t do or say it at a job interview, don’t do it or say it on social media. We have the ability to broadcast our voices publicly, but that does not mean we should tell the whole world every woe and annoyance that comes into our lives. Take five seconds before you post something. Those few seconds could save you from making a poor decision. And, help set you up for success outside of college.